Groupon has a hot deal available today! 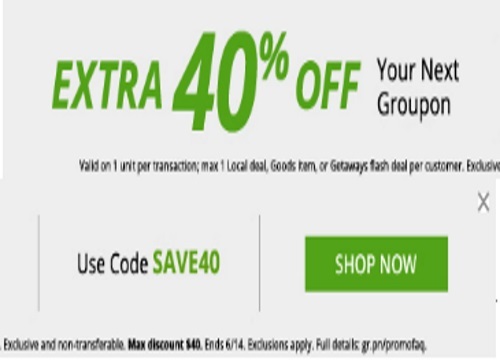 Save 40% off your next Groupon with the promo code below! Enter the promo code SAVE40 at checkout. Valid on 1 unit per transaction. Applies to any local deal, good item or Getaway flash deal. Can be used up to 3 times per person. Offer is valid until June 14, 2016. Max discount $40.